You might be familiar with Wrangler jeans and Timberland polo shirt. But do you name of the company that own these brands? 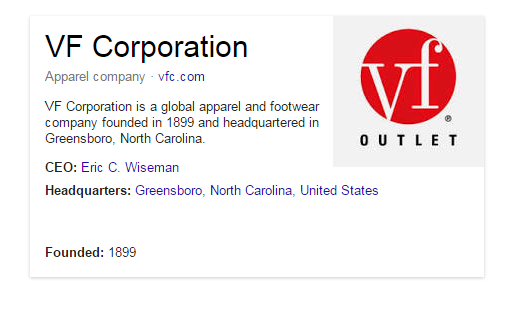 It is VF Corp.
Do you know how many brands are owned by VF Corporation? Many of their brands are well known to us. But you may not aware that they are part VF. Here is the big list of their brands and product types they have under those brand name. 7 for all Mankind: 7 For All Mankind® is the world’s premiere brand of denim-lifestyle products. Founded in 2000, the Los Angeles - based premium denim brand quickly earned critical acclaim due to its innovations in fit, fabric and finish. Products are sold in 7 For All Mankind stores, online, and in luxury department and specialty stores in over 80 countries worldwide. Ella Moss: Bright color palettes, simple shapes and soft, wearable cottons are signatures of the Ella Moss® brand. With contemporary lifestyle collections for women, girls and toddlers, Ella Moss offers apparel that’s as fun and feminine as it is functional. Lee: Lee® Jeans have a proud history stretching back to 1889, and a heritage of quality clothes that are not only classic, but comfortable too. That's why today Lee is one of the most popular work and casual brands on the planet. Rutler: These are hard working jeans, made to take on whatever the job – or the day –dishes out. Rustler® jeans, pants and shorts are made tough for guys who wear them tough. Majestics: When performance counts, the pros count on Majestic® athletic wear. Napapijri: Initiate your own expedition with the Napapijri® brand’s innovative technical backpacks, bags and apparel. With discreet colours and an emphasis on comfort, Napapijri products meet the needs of demanding travelers with a focus on style that is entirely unique. Nautica: Founded in 1983, Nautica® is a leading global lifestyle brand that ranges from men’s, women’s and children’s apparel and accessories to a complete home collection. Nautica products are refined casual classics inspired and energized by the water and always crisp, clean and distinct. JanSport: For more than 40 years, the JanSport® brand has celebrated outdoor enthusiasts, whether they’re scaling peaks or strolling across a city park. Whatever your goal, our backpacks, bags and totes get you from point A to point B in the most functional and stylish way possible. Kipling: These days, a bag is an accessory that has become essential. One of the cult objects of today's life, it is an integral part of our personality - show me your bag and I'll tell you who you are. Trendy, fashionable, practical and informal, Kipling® bags are part of the everyday life of more than 35 million women in 65 countries throughout the world. Lucy: Offers beautifully designed lifestyle apparel that inspires women to live healthy, active, balanced lives – with style. No one else blends active fit, feminine style and everyday performance like the lucy® brand. Wrangler: Denim is the soul of the Wrangler® brand. Designed for purpose, Wrangler was originally created to be the best jean, jacket and shirt for the riding cowboy. Functional design details, introduced when the brand launched in 1947, remain vital today & come to life within Denim Performance & Live In Denim, the brand's innovative answers to new everyday challenges. Eagle Creek: Eagle Creek® products are inspired by travel. Each one is built to withstand the rigors of the road, backed by a lifetime guarantee. A lifetime, we assume, spent in the hands of a curious, adventurous soul. The North Face: The North Face® offers the most technically advanced products in the market to accomplished climbers, mountaineers, snowsport athletes, endurance athletes and explorers...or anyone with a passion for innovative style. Reef: Reef® is the exotic surf brand enabling your journey of discovery…since 1984. Reef aimed to provide premium, comfortable and innovative products in a sustainable manner. Riders: Riders®, by the makers of Lee® jeans, fits everything about you. Not just your waist, hips and thighs, but your lifestyle, attitudes, personal goals and aspirations. Riders reflects your desire to look great and feel great without sacrificing comfort. Riders fits you, beautifully. SmartWool: Based in Steamboat Springs, CO, SmartWool® is a brand whose products are inspired by living and playing in the mountains. Timerland: Timberland® is the authentic New England brand that equips you to make the most of your outdoor experiences. Timberland builds environmentally-conscious gear that is outdoor proven, great looking and built to last. All the following information gathered from VF website and associated brands' website. VF corp and its apparel and footwear brands.